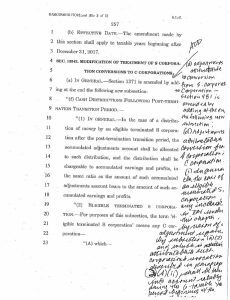 The competing House and Senate tax reform bills are large, complex, and often difficult to understand. 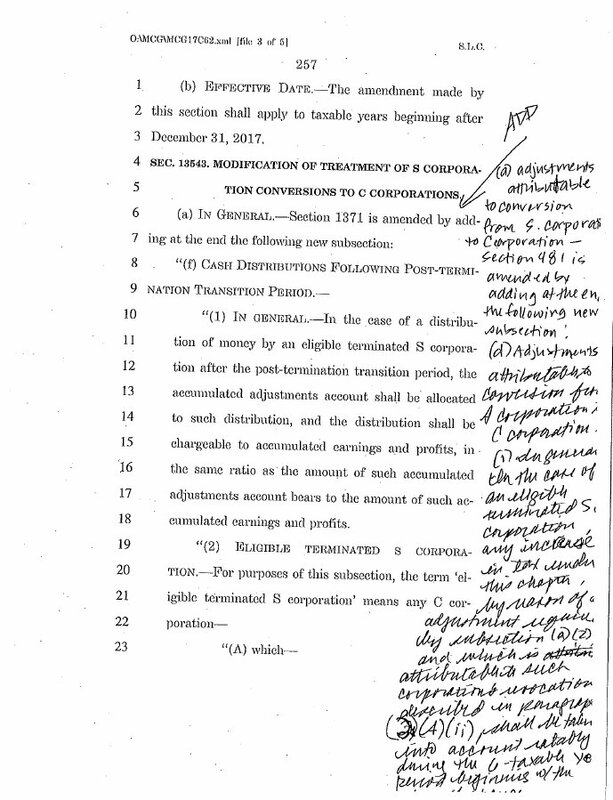 The Senate bill, for example, is a 479-page document that was passed early in the morning last Saturday and that included last-minute, hand-written passages as shown to the right. There are numerous parts of each bill that have a large impact on colleges and universities in the country, as well as their students. One estimate calculated after the House bill was passed is that if enacted into law, it would cost students and their families $71 billion over the next ten years. Now that both chambers have passed bills, a conference committee will try to hash out the differences and agree on one bill to be passed by both the House and Senate and sent on to President Trump to be signed into law. One provision that differs between the two bills, and has received little attention outside of the higher ed community, is one in the House bill that would make many categories of tuition waivers newly taxable (the Senate provision does not contain this change). One example of this is graduate students at a university who, in return for working as a teaching or research assistant, are granted a tuition waiver that allows them to attend the institution tuition-free. Under current law, these students are not taxed on the value of the waiver. Most of these students also earn a stipend for their teaching or research duties, and the wages associated with that stipend are taxable. But because most of these stipends are relatively low, most graduate students find themselves in a very low tax bracket, and with other deductions and credits, often have little or no tax liability. The House bill would change the treatment of the tuition waiver and would add its value to the student’s taxable income. This change would have two impacts on the the student’s tax liability: 1) it would require the student to pay taxes on the value of the waiver; and 2) it would most likely push the student into a higher tax bracket, so the value of the tuition waiver would not just be taxed, but would be taxed at a higher rate. This graduate student’s tax liability would increase $7,295, an amount equivalent to 32% of his gross wages. Many graduate students would struggle to find ways to pay this increased tax burden. And if their states piggybacked on federal tax reform to make the waivers taxable at the state level as well, the tax increase would be even greater. This employee’s tax liability would increase $20,757, or 42% of her gross wages. And again, this amount would be multiplied if the State of California, following on the federal government’s move, decided to tax the value of tuition waivers. These tax law changes would make it much harder for universities to attract graduate students as well as employees. The value of tuition waivers to both groups is an important recruiting tool for universities, and making them subject to federal (and possibly state) taxes would greatly diminish their value. I urge the conference committee to throw out this portion of the House bill and to align with the Senate version, which would retain the non-taxable nature of these vouchers.